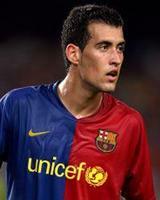 Sergio Busquets (born 16 July 1988) is a Spanish footballer who plays for Barcelona, as a defensive midfielder. Busquets was born in Sabadell, Barcelona, Catalonia. In 2005–06, he joined local Barcelona's youth ranks, scoring seven goals in 26 matches for the Juvenil A team in the following season. Two years later, he was promoted to the B team under Josep Guardiola, and helped it achieve promotion to the third level, with one goal in his 32 appearances. In that same season, Busquets would make his first team debut, in a Catalonia Cup match, coming on as a substitute. On 13 September 2008, Busquets played his first top flight match, 90 minutes in a 1–1 home draw against Racing de Santander. During Barcelona's UEFA Champions League match against FC Basel at St. Jakob-Park on 22 October 2008, he scored the second goal in the 15th minute in a 5–0 win. In early December, in another start, he scored his second goal with Barça in the competition, netting in the 83rd minute of a 2–3 home loss against FC Shakhtar Donetsk. On 22 December, Busquets signed a contract extension until 2013, with a buy-out clause of €80 million. On 7 March 2009, Busquets netted his first goal in the championship in a 2–0 home win over Athletic Bilbao. On 27 May, having been regularly used in the league as he competed for the spot with internationals Seydou Keita and Yaya Touré, he also featured in Barcelona's starting XI in the Champions League final, a 2–0 win over Manchester United. With that victory, Carles and Sergio Busquets became only the third father and son combo to both have won Europe's top club competition playing for the same team, joining Manuel Sanchís Martínez and Manuel Sanchís Hontiyuelo (won it with Real Madrid) and Cesare Maldini and Paolo Maldini (A.C. Milan). Busquets' fine form continued in the 2009–10 season, with Guardiola preferring him to Touré as Barcelona's holding midfielder. In the Champions League semi-final against F.C. Internazionale Milano at Camp Nou, on 28 April 2010, he exaggerated a push which caused Thiago Motta to be sent off. The television replays show him theatrically falling and holding his face, and later peeking to see if his simulation was being believed.